Wow, that was a gig! A great gig indeed. If the Harlow Museum was welcome proof that Pete is back in action then tonight was the wide-screen version which made me at least wish that a film crew from the BBC had been there to capture it (hey if it's good enough for Van Morrison...!). The addition of Simon Wallace seemed to give the songs room to breathe and open up. Simon is an exceptional accompanist who in true Jazz style sometimes seems to allude to the tune rather than forcing it upon you. That left Pete free to lead and unencumbered by playing the piano he focussed on singing the songs, sometimes it seemed almost as if for the first time, weighing each phrase and varying the emphasis in repeated lines. If the guy in the song thinks "30 years in the racket" is a long time he should follow Pete who has spent longer but who managed to bring an amazing freshness to these songs last night. Set Lists I am leaving to others since I know they will be coming (Hi John!) but highlights for me included a terrific Dancing Master and a fierce (military-style) Colours of the Night. One notable addition was Let's Try The Whole Thing Again, one of a few songs added at the last minute to the set-list which led Pete to play the piano himself and Simon to sit and watch. On other songs Pete played guitar along with Simon but for much of the time he simply took the luxury of sitting on the stool, as in my snap above, and just leaning into the music so excellently played by Simon. This was Pete on as good a form as I have ever seen him - what a treat! I wholeheartedly agree with Sean, it was a wonderful and varied set, the songs sounded fresh and Pete's stories and introductions to the songs added something new. A very good evening was had by all. With my tongue in my cheek, given the teams playing just up the road at Stamford Bridge yesterday late afternoon, Carnatiions on the Roof may have been an apposite addition to the set. Lovely venue, I have been there before. Like Ian Ashleigh and party we got caught up in the Chelsea football traffic, dumped cars at World's End and walked the final stint. Ian suggested Carnations on the roof might have been appropriate, I thought perhaps Rider to the World's End. We had booked a table in advance so were straight in front of the stage, next to Sean Kelly. Sean took much better photographs, as well rescuing us from a napkin that caught fire from a candle, so I won't post one of my photos. As already mentioned by others Pete and Simon were outstanding. My favourite on the night was Thirty year man. Antoinette who is a newbie Midnight Voice particularly liked BOTBS and Hypertension Kid, the latter for its unusual rhythm. Pete said early in the proceedings that this was the first of a hopefully lengthy series of farewell concerts. Very lengthy, I hope. The greats are leaving us at a fast rate at the moment. Thanks, John! That's a great set-list. It was a gig we would have liked to attend. Huge thankyous to everyone who took the trouble to come and who responded so encouragingly and generously. 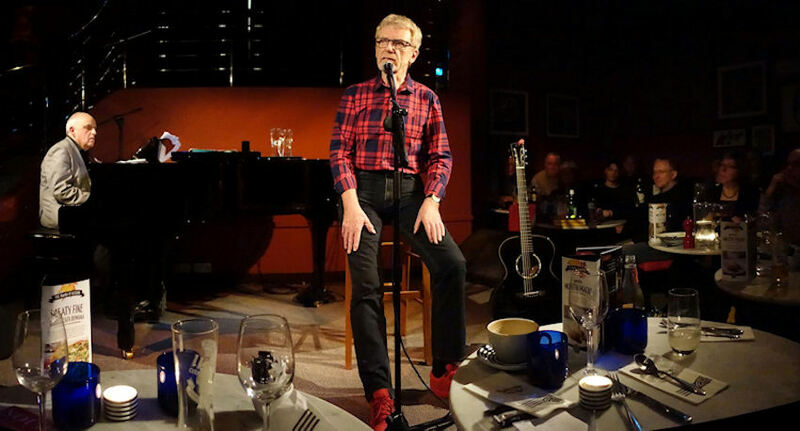 I'm only sorry that the 'dressing room' arrangement at the Pheasantry (anyone who's been there will understand the significance of the inverted commas) meant that I didn't get the chance to say even a quick hello to a lot of people it would have been good to greet. I knew in advance that working with Simon Wallace was going to be a major plus, a huge advantage for a whole bunch of good reasons. It was a particularly signficant one for me, as I'm sure you all understand, so all the more reason for further thanks to everyone, including the Pheasantry staff, who I thought were all terrific, especially Graham who did such a great job on the sound. I'm sorry I missed it all.